Purchasing a paddle board can be stressful if you're new to this activity. There are many types out there, and some of them come with specialized features. Among them all, the touring types are by far the most popular ones. That's when ISLE 12'6 Airtech Inflatable Paddle Board kicks in to make your life easier. It's the best touring SUP on the market and for good reasons. When comparing a touring paddle board vs. all around, this model allows higher speeds, at the same time also ensures a smooth control. It's worth going through an inflatable SUP review or two before making your final choice though. 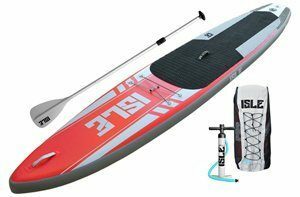 So, in our review, we are going to cover the key specifications of ISLE 12'6 Airtech inflatable SUP, explains why is stands out of the crowds, together with its pros and cons. Given the inflatable profile of this board, it's obvious who it's mostly indicated to – those with storage or transportation limitations. A hard board requires professional storage to prevent damaging it. You'll need plenty of space in a shed or a garage. If you live in a flat, it's not going to happen. Instead of having your board, you might have to rent one whenever you feel like paddling. Transportation is also a standard issue. You might need to buy a professional roof rack – assuming that you have a car. Sometimes, you'll need to rent a trailer. Again, there is too much hassle involved, while expenses are not to be overlooked either. An inflatable board clears all these minuses. Once deflated, it can roll up and go into a backpack. You can store it in a cabinet, a wardrobe or the corner of your room. Transportation is also simple. Throw the backpack in the boot of your car or put it on and head to the beach – simple as that. 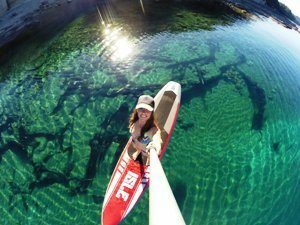 If you are looking for other types of SUP, check this out. On another note, lots of people would invest in the best expedition SUP for a few reasons. It's pretty much similar to all-around paddle board; only it allows higher speeds and more comfortable control. 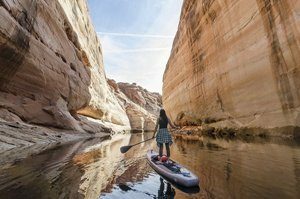 Even if this is the first time you paddle, and you lack experience, you can still use this model to learn and become better at it. Plus, it shares multiple features with the all-around models, so it's suitable for fishing, learning, and even yoga. Most people interested in paddle boarding do it for two reasons. First, it's an optimal way to relax and reduce stress. Imagine paddling through calm water – no noise around you, but just the sound of water as you glide. Second, it makes a significant recreational activity. Whether you go paddling with your family or some friends, it makes a great weekend activity. 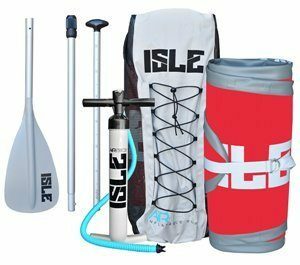 However, ISLE 12'6 Airtech Inflatable Paddle Board is not all about relaxing and chilling, as it also brings in a series of health-related advantages. It can improve your balance, focus, and concentration, which will inevitably reflect over your everyday activities. It will boost your strength and improve the heart function, as it does a perfect cardio exercise. Plus, it's a low impact workout, so you won't feel too much soreness once you're done. Built with convenience and speed in mind, ISLE's paddle board is likely to support riders of all skill levels. It makes no difference if you're an experienced rider or you're just starting. Apart from its speedy profile, it's easy to maneuver too, whether you glide in calm waters or a fast river. 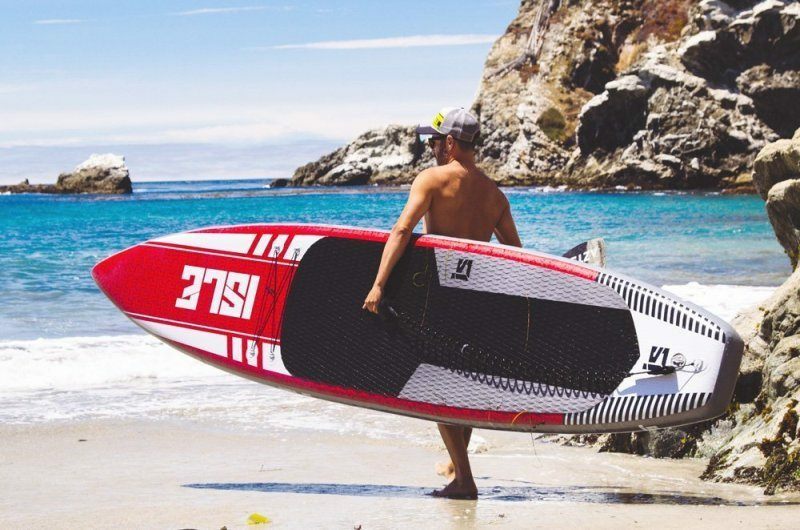 ISLE 12'6 Airtech Inflatable Paddle Board is exceptionally lightweight. Sure, it may still raise some problems if you're small and skinny, but overall, it's easy to carry around over short distances. Generally speaking, it's up to 30% lighter than other models in this segment. Apart from the easy transportation, it's faster on water too so that you can cut through waves without problems. Regarding durability, you can count on military grade PVC. Sure, it's not as smooth as the surface on a hard board. In fact, it's rough and may generate some resistance on water. But the shape and length of this board compensate for this. After all, you don't want a board that will break down within a few months. Although it comes with a repair kit, chances are you'll never have to use it anyway. The paddle carries the same characteristics. It’s made from lightweight aluminum, while the blades are made from hard rubber. Even if you hit a rock, the rubber is flexible enough to avoid damage. At the same time, it's solid and sturdy to push water properly while paddling. The PVC construction prevents a series of issues associated with hard boards. Most importantly, you can forget about scratches, cracks, and dents. There are many reasons wherefore this model can qualify as the best touring SUP for 2018. The full package is one of them. You can use this board out of the box. The accessories include a paddle, a carry backpack, a pump, fins and a repair kit. Take it out of the box, inflate it, set the paddle up and go to the nearest water. You won't have to purchase any extra accessories. However, the pump is manual and might find hard to use if you're not the fitness type. Plus, you might want to preserve your energy for the actual paddling experience. Therefore, some people choose to buy separate electric pumps. Apart from the actual package, you get a versatile board with proper loading functionality. The bungee system allows attaching a wide variety of equipment. Moreover, you have 4 D rings on the deck for add-ons. You can get extra paddles, some cameras, camping equipment or whatever else you have in mind for this trip. The board can quickly take up to 275 pounds of weight. If you're not that heavy, you can fit a lot of stuff on the deck. If you've done your homework, you probably know already that it's hard to have both stability and speed on a paddle board. That's because the width defines balance. The wider it is, the more stable it becomes. This model is 30 inches in width – a standard width for all-around boards. Other touring or racing boards in this segment are narrower. On a plus note, the extra width allows more storage. However, you won't have to compromise on speed though. It's longer than most other boards in this category, so it compensates for the width. Simply put, it maintains the same ratio as any other touring board, hence the possibility to achieve high speeds. Stability also adds to its versatility. 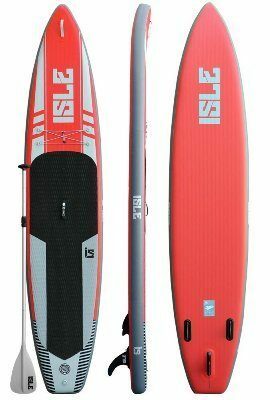 While advertised to be the best touring inflatable SUP, ISLE's board can be used as an all-around board too. It's wide enough and stable for beginners and even children. Also, the nose is quite wide, as well as the tail. This kind of shape is more common in yoga paddle boards, so you can just as well take your daily exercises and meditation on this board. Tired of paddling? Interested in sitting down? The paddle comes in 3 pieces – one aluminum stick and two blades. Just fit the second blade to the other end and you can use this board as a kayak. You can use it while sitting down or on your knees. It's so long and full that you can also lay down and relax while paddling with your arms. As a short conclusion, ISLE 12'6 Airtech Inflatable Paddle Board can quickly make the best touring SUP for a series of reasons. Rated at 4.4 out of 5 stars, it's good enough to tackle most customers' needs. Up to 90% of all buyers find it to be perfect or almost perfect.